1. Push the "PANIC" button on the transmitter. 2. At the same time, the alarming horn will sound and the turn signal lights will blink continuously for 30 seconds. 3. 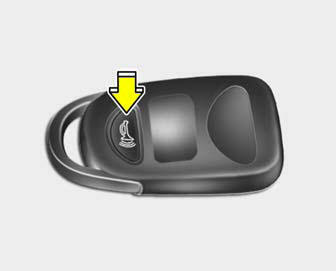 To turn off the system, push any button on the transmitter or lock/unlock the doors by turning the key. Do not change, alter or adjust the theftalarm system because it could cause the theft-alarm system to malfunction. The system should only be serviced by an authorized Hyundai dealer. Malfunctions caused by improper alterations, adjustments or modifications to the theft-alarm system are not covered by your vehicle manufacturer warranty.